Well, it’s taken me a month and a half to finally reach three miles without having to cut the run short due to numb feet or my knee feeling like it’s sliding down the side of my leg! Started off slower than usual as I wanted to take it a bit easier than usual… when I reached a turn in the road on the way back I decided to run an extra 0.5 to take the route to 3 miles. Legs are feeling it a bit now so I’ll be running a shorter distance tomorrow. 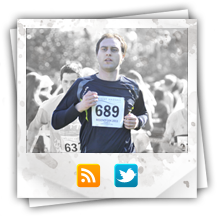 This entry was posted on Wednesday, June 2nd, 2010 at 9:55 pm	and is filed under Juneathon, Running Analysis. You can follow any responses to this entry through the RSS 2.0 feed. You can leave a response, or trackback from your own site. « Juneathon Day 1… and we’re off! Brilliant! My anatomy’s poor, but I’m lead to believe that knees should usually be at the front. Well Done. 3 miles and in a great time too!